Nurul Ali. | Singapore Fashion & Lifestyle Blog: Preparations + Tips! I know I should be blogging about the event itself but I’m having difficulties to download the photos that OMY.SG has provided. I tried downloading via my laptop at home but the wifi connection keeps disconnecting itself. Next solution was to use the office computer, but it took more than 2 days to download it! I don’t even know if the downloading has completed – Haven’t been to the office for days! Hence, I thought I should at least blog about the preparations first while I wait for the photos to be downloaded. 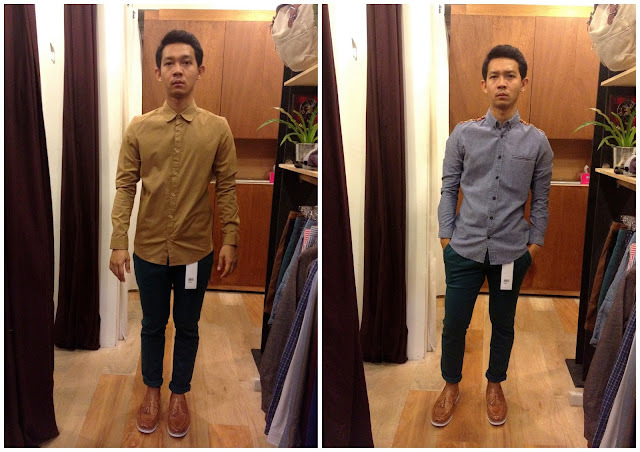 Two days before I was allowed to start loaning the items, I went down to Bugis+ to do a bit of “recce”. I went through shops by shops and amazingly almost all the shops I went in carries clothes that would fit my theme. Tip #1: It’s best to do recce and loaning on separate days as this would save more time on the day you do your loans. Loaning normally takes sometime because eg: You need time to think if the top you picked matches with the bottom. / You need to visualize if the outfit looks good on your models/ etc. Tip #2: If you spotted clothes that would work with your theme, snap a picture! This will help you when you do loans on the day itself. Just in case you haven’t figured what my theme was all about based on the photos I have provided here, the theme is actually FUN. Yes, all about having fun! 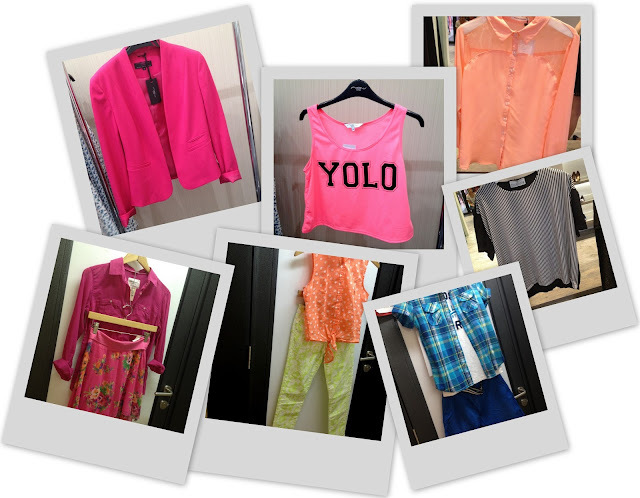 Expect to see bright/neon colors, prints, print on print, and color blocking! Perfect for the Spring Summer season. Left my office at 6.30pm sharp and rushed down to Bugis+. This time, it’s to pick outfits for my models. Spent about 20 – 40 minutes in each store pairing outfits for my models. It was quite…err… tough! Especially when you found something nice, but the right size was sold out. Very disappointing! Nonetheless, everything went smooth. Most of the sales staffs I met were nice and helpful. However, there are some of them who shows attitude, giving stares and refused to help. I’m not gonna tell you which shop it was but it’s really sad because they are presenting the brand they are working for. Wake up people! Tip #3: You might be facing such situation (problematic sales staffs. LOL) in some shops but I’d suggest you ignore them and continue to do your sourcing, After all you need your job to be done. So yeah, just do your thang! I didn’t have the chance to do fitting on the girls as most of them are probably busy with their full time job and school. Plus, I know it’s such a hassle to make them come all the way down to Bugis just to try out the clothes. So I took the risk of picking the sizes given by them. I remember feeling worried if the clothes don’t fit them well. When I got home, I started compiling all the photos I took, print it, cut it and paste it on my notebook. I also scribbled some notes. This will come in handy on the actual day of the event. It's like a check list! Picking outfits for my male model, Audi was the easiest by far. Probably because he was around when I did the loan and… he could pull off almost any outfit? Lucky dude! Settled his outfits within 30 minutes! Or even earlier! I think? Headed to Tong Seng with Audi and Fifa for our late dinner. While waiting for our food to be ready, I was busy squeezing my brain juice thinking of what songs should be used for my show. Only then I realized the right person I should ask about music was right in front of me!!! Oh silly me. SHOUT OUT TO FIFA AKA AFI AKA BATWOMAN AKA MY "ASSISTANT". Thanks for being a wonderful “assistant” and suggesting those songs! It really means a lot to me! I’m sorry I was a bit fussy with the songs selection. But hey, those songs you suggested were good, though! It was the last day to finalize everything but some things are not even done. Like the runway music? I mean yes, I have selected the songs I want but it wasn’t mixed and burned to a CD yet. Thank god for my talented colleague, Kabi! He kindly mixed the songs for me when I seek for his help. Teehee. Thank you!!! Choreography was planned on the night itself. I brainstormed so many ways to make the models “waste more time” on the runway so that they will have ample time to change for their next outfit. Ahuh, that’s how we cheat. Till then. Look out for my last entry on Bugis+ Star Style Blogger 2013 actual event!